When does the Internet help your learning? When does it distract from good learning for you? How might your answers to these questions be similar to or different from the answers your students might give? How might you support your students in using the Internet as their own personal learning space? I LOVE this prompt! For lifelong learners like myself, the Internet has been a blessing (and a curse, at times)! I mostly joke about the curse, of course…but it has led to more than a few other tasks not getting done and even more than a few late nights! This mostly happens when I lose focus on my objectives and what I am working on at that moment. It is almost always something related to what I am working on, and not Facebook, Pinterest etc. But sometimes there are those shiny articles in other areas of interest that pop up…and I have to reign myself in. I find bookmarking and to-do lists in One Note to be a huge help at times like these! I have several hobbies that have benefited over and over again by engaging in forums, researching websites, ordering materials (books mostly), checking my social media connections etc. I have been able to learn new skills, enhance or refresh current skills, discover new passions/interests and meet people who more than likely would have never otherwise crossed my path! I think student answers to these prompts would be less on the learning side in most cases, and more on websites/apps that enable them to socialize with their friends more. This could be a gray area, but I think most students K-12 and many in college like to and should be socializing with their friends. It is just harder to balance that and school for them, I think. Again, some, not all. I encourage students to use the Internet for finding out more about topics of interest, to share their work, and to get to know others…BUT, in a responsible way. Good digital citizenship does need to be taught or at least made aware that it is a focus in the classroom. Just because they may use the Internet and social media, does not always mean they know how to do so in a responsible way. My job history, like many I would assume, includes jobs that were not entirely suited to my career goals. Having groups and forums online that I could participate in and people who I could network with allowed me to keep up what I was learning in college and continue to move forward in my field. For the most part, my professional life has existed mostly online. Due to that I feel a real sense of community when I am online…so many people who I have never met, but appreciate and enjoy learning from and talking with! Communication within those groups often makes more sense to me. This could probably be (as we have talked about in past modules) due to being able to better focus on the message when online…in person, there are tendencies to misread people or be distracted by other things going on around you. Different personality types can conflict more easily and sometimes the communication is one-way. True, there is the possibility that messages online can be misread or misinterpreted, but I feel that is something that can be overcome. One of the most useful and frequented professional networks that I participate in is the Adobe Education Exchange. I engage in the community as a learner, a trainer, an instructional designer and a moderator. There are live and on-demand classes to take and tons of great resources on using Adobe products. Since I use a lot of these in my work as a trainer and ID, I find it invaluable. 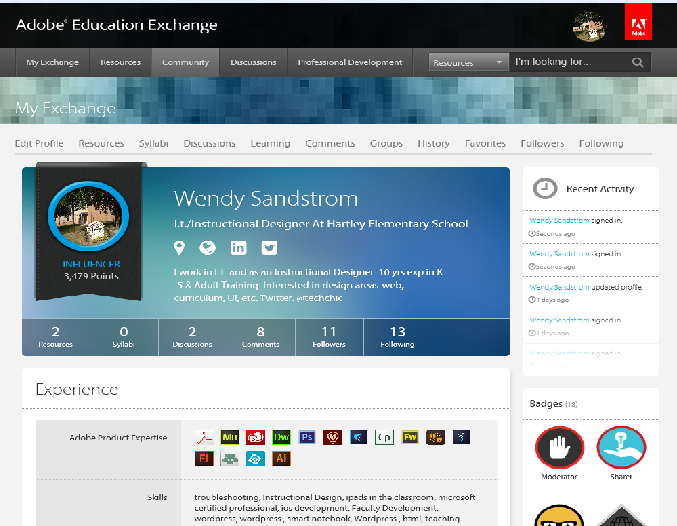 My profile on the Adobe Education Exchange. Most recently I have become an Adobe Campus Leader (ACL) and an Adobe Education Trainer (AET). Some of you may have seen my past post from my T4T classes (Training for the Trainer)…the first Adobe T4T was last Summer. The most recent one I am actually finishing up this month...the focus of this T4T is eLearning. The courses are a great way to learn new features of Captivate, Photoshop, Dreamweaver, Muse, etc. (Photoshop alone could keep almost anyone occupied with things to learn for a long time!) I have used a few of the resources and lessons here in my Community Education courses and with staff at my full-time job. Last year we received a grant from Adobe (HOORAY) for Photoshop Elements, Premiere Elements, and Captivate so I am gathering ideas and formulating a plan for professional development. This site and the ConnectEd group I am a part of is and will be a primary resource as I work on that project!